Download Version 1.00.03.00: Small maintanance update fixing the Source selection bug: Source names are incorrect. 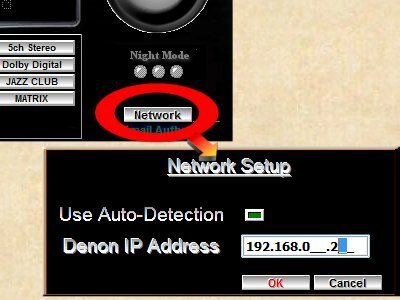 Version 1.00.02.00: If Auto-detection does fail, the user may now enter a manual IP address. See example below. Version 1.00.01.00 The aim of this release is to confirm Network Auto detection and basic feature use/feature detection. Note: The volume knob in Version 1.00.01.00 only sets the volume on the Denon 3808 after the user releases the mouse button. The intended usage is for the user to turn the knob to the desired volume and only this volume is sent to the receiver. In theory, it is possible to set the volume from 70dB to 0dB in one step. This would not be too kind on your speakers. In later versions I'll apply some filtering on this to prevent a volume change of more than +-15dB.